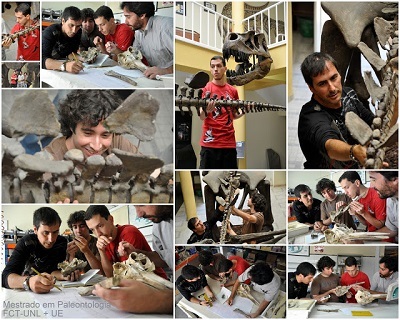 Enrolling in the Master in Paleontology is done here: Inscriptions and More Information. See "step by step" PDF tutorial if you need help. c) provid a strong foundation and knowledge in the area of ​​paleontology allowing the future graduates to make conscious initiatives regarding the paleontological / geological heritage. 1. Expand training in the field of paleontology, in order to acquire sustainable foundations for the transmission of knowledge related to this scientific area. 2. Acquiring scientific and technical training in the field of paleontology, allowing us to understand and solve new paradigms in multidisciplinary contexts, in particular for a better and more conscious performance of technical activities of classification and management of the natural environment, particularly the Paleontological the responsibility of public authorities (Ministry Environment, Spatial Planning and Regional Development, Ministry of Public Works, Transport and Communications Works and municipalities). 3. Develop skills to integrate knowledge in complex geological settings. 4. Develop a critical view of the fossil record and its importance for understanding the process of evolution. 5. Analyze and discuss the biological aspects of the bodies from the past. 6. Discuss and apply theories, concepts and paradigms in order to obtain a comprehensive and adequate view of the History of Earth and Life. 7. Acquire skills and autonomy in formulating proposals to submit scientific projects, especially the national programs in the responsibility of the central and regional government. A country with a rich paleontological remains unexploited projects. 8. Gain skills that provide the graduate a high degree of autonomy to further develop and acquire a lifelong training in related disciplines and paleontology, with a high degree of autonomy. Why to Study at FCT-UNL, in Portugal? Because gathers top paleontologists and professionals, which will provide a state-of-the-art MSc programme in Paleontology. Because Portugal has an amazing paleontological heritage which may give excellent topics of research. Because is fun! Portugal has a great friendly atmosphere to study. The faculty is close to the beach and fossil outcrops. And don't forget the great weather and tasty Portuguese food and wine! Plus, we help you to find the most suitable accommodation possible.